An avid horse lover and 4-H alum, Kelsey Torak had her future as a veterinarian all sewn up. That was, until she tried a few Aquaculture classes at the Faculty of Agriculture and became hooked on farming the sea. A native of Shelburne, Kelsey is wrapping up her fifth year on the Agricultural Campus. Set to graduate in May with a Bachelor of Science (Aquaculture), she never imagined she would be focussing her studies and career on creatures of the sea. From the age of five, Kelsey has been involved in the sport of horseback riding. With her love of horses and her experience in 4-H, she had always pictured herself working with animals. Wanting to continue to study at the Faculty of Agriculture on the Agricultural Campus, Kelsey started looking into other programs. Aquaculture was brought to her attention by some of her friends. Within her first few classes studying aquaculture, Kelsey was hooked. With graduation on the horizon, Kelsey has a full-time job lined up with Scotian Halibut Ltd. Scotian Halibut Ltd is currently the only Atlantic halibut juvenile producer in North America. It is a fairly small company with 11 employees at the hatchery location in Clarks Harbour and seven employees at the grow-out location in Woods Harbour. The Clarks Harbour location where Kelsey works is managed by Shelley Leblanc, also an alumnus of the Faculty of Agriculture. During the summer between her third and fourth years of study, Kelsey worked for Scotian Halibut Ltd. She worked hard and established connections and was able to secure a full-time job there for when she graduates. 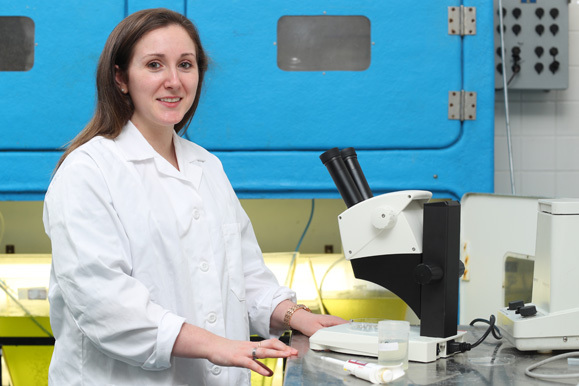 At Scotia Halibut Ltd., Kelsey can often be found behind a microscope looking at the development of fish larvae. “I look at the development of the jaw, heart, gut, kidney and tail very carefully to see if any of the larvae contain any abnormalities and if any bacteria are present,” Kelsey explains. She will also be responsible for cleaning tanks, feeding fish, insuring oxygen saturation systems are working properly, updating data files and creating graphs of important data such as the weight of the fish over time as they grow. Kelsey will also work with the hatchery manager in the brood stock tanks collecting eggs and milt (sperm) from brood fish that will be used to produce larvae. The larvae that is produced will be grown at the facility for a few months before they are shipped to Advocate Harbour, PEI and Norway where they will be grown to market size. As Kelsey finishes her last classes at the Faculty of Agriculture, she reflects on her time spent on the Agricultural Campus. She recalls how she first learned of the campus and the programs they offer. Kelsey adds that she owes some of her academic success to her time spent in 4-H growing up. Although there are a number of things she loves about the AC, the small class sizes were truly a draw for Kelsey. The small class sizes allow students to have close relationships with their professors. Learn more about the Aquaculture Program at the Faculty of Agriculture.